If you're considering growing ginger just remember that it is a tropical plant, therefore thrives in tropical type surroundings. I grow mine in containers in the greenhouse and this is recommended. However, if where you live does have a tropical climate, then you can happily plant it outside in your garden. In my greenhouse I can replicate the conditions easily that it prefers: moist rich soil, filtered sunlight, humidity and warmth. It also gets protection from conditions it doesn't favour: direct sun, cold, high winds and I can control the water as it hates being waterlogged. 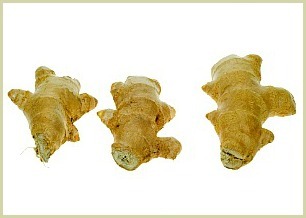 If you don't have any ginger plants to get root divisions from, then a fresh root from the store is fine to use. Read more general info about the plants. Pick one that is plump, has smooth skin and established growth buds. As many suppliers use a retardant to stop them sprouting in the shops, then soaking the roots in a bowl of water for 24 hours to remove this retardant is a good idea. As it's a tropical plant you need to get the soil right for optimal growth. I use 1 part compost to 1 part good garden soil with some sand thrown in. This creates a moist, rich and well-draining growing medium. If you have established ginger plants then this is easy to do. In rich, well-draining soil (see above), plant your roots 3 inches (8cm) deep and 6 inches (15cm) apart. Add some fertilizer when planting and a liquid feed every month. Keep the soil moist but don't overwater. If it rains too heavily it may wash some of the nutrients away, so give a liquid feed if this happens. A layer of mulch will help keep the moisture where it's needed. You can harvest the roots once the leaves have died back. These may be small and immature but still good for eating. I recommend letting it regrow for another season and harvesting then. The roots will have matured and the flavours will be sublime. Not too much to worry about if grown outdoors. Indoors you may get spider mite and greenfly. Treat with an insecticidal soap solution. Spring: Divide established roots and replant. Give a liquid feed. Summer: Give a liquid feed. Autumn: Give a liquid feed. If the leaves have died back you can harvest the roots.Winter: Dig in well-rotted compost or manure ready for spring planting (if you live in the right climate). If you've managed to get a good harvest, I recommend making a super healthy drink with the fresh roots. Click to find out how to make fresh ginger tea. Chives - Probably the Easiest Herb to Grow!